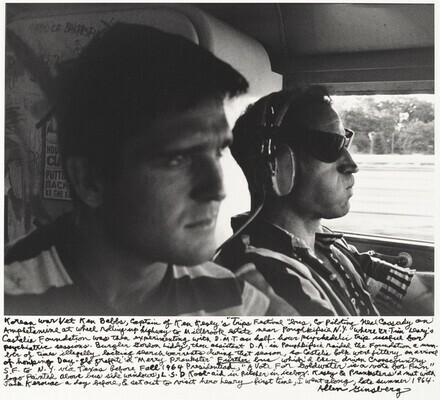 Home » Collection » Korean War Vet Ken Babbs, Captain of Ken Kesey's "Trips Festival" bus, co piloting Neal Cassady on Amphetamine at wheel rolling up highway to Millbrook estate near Poughkeepsie N.Y. where Dr. Tim O'Leary's Castalia Foundation was then experimenting with D.M.T. on half hour psychedelic trip useful for psychiatric sessions. Burglar Gordon Liddy, then assistant D.A. in Poughkeepsie raided the Foundation a number of times illegally lacking search warrants during that season, so Castalia folk were jittery on arrival of honking Day-Glo graffit'd "Merry Prankster" Further bus which'd been driven cross-country S.F to N.Y. via Texas before Fall 1964 Presidentiad, "A Vote for Goldwater is a Vote for Fun" logo painted above bus side windows, L.S.D. Kool-Aid in pitcher in icebox. Kesey & Pranksters had met with Jack Kerouac a day before . . .
Korean War Vet Ken Babbs, Captain of Ken Kesey's "Trips Festival" bus, co piloting Neal Cassady on Amphetamine at wheel rolling up highway to Millbrook estate near Poughkeepsie N.Y. where Dr. Tim O'Leary's Castalia Foundation was then experimenting with D.M.T. on half hour psychedelic trip useful for psychiatric sessions. Burglar Gordon Liddy, then assistant D.A. in Poughkeepsie raided the Foundation a number of times illegally lacking search warrants during that season, so Castalia folk were jittery on arrival of honking Day-Glo graffit'd "Merry Prankster" Further bus which'd been driven cross-country S.F to N.Y. via Texas before Fall 1964 Presidentiad, "A Vote for Goldwater is a Vote for Fun" logo painted above bus side windows, L.S.D. Kool-Aid in pitcher in icebox. Kesey & Pranksters had met with Jack Kerouac a day before . . .
Gary and Ellen Davis, Greenwich, CT; gift to NGA, 2011.